Pottery Painting, fun for everyone! Penguin mania & Frozen Frenzy! You Can be as Dotty as Us! Round up the Mums for Fathers Day! Treasure the Tiny Hands and Feet of Your New Little Life! Great gift for your Teachers! The countdown to Christmas begins! Paint a Dragon for St Georges day! Everyday is a Fairy Day at Crafty Monkey! Today is National Pet Day! Happy 6th Birthday to us!!! Olympic Fever and how a local school has commemorated it! The end of the school term may seem like a long way in the distance, but before you know it, the summer holidays will be upon us (yay!) and you’ll be thinking about all the wonderful activities that you can get involved with at Crafty Monkey! But have you decided what you’re going to give to your child’s teacher as a ‘thank you’ gift? If not, then there’s no time like the present to put on your creative thinking caps. Teachers spend their lives getting hands on and creative with your children, so now it’s time to give something back and there really is no better place to start than Crafty Monkey. We can pretty much guarantee that you’ll find something for every kind of teacher here. We have items starting at £4 with no studio fee which proove popular, we have tea sets for the tea lover, latte cups for the coffee lover, cake stands for the cake lover and trinket pots for the… er…trinket lover! As most of you will know, our studio is bursting at the seams with a huge range of pottery and your creative gift doesn’t necessarily need to painted- remember that you can also decoupage your way into fashioning something lovely for teacher to display! – we’ve done lots of great plates, vases and plant pots where the children put a fingerprint on and their name, the fingerprints can be made into all sorts of things – a favourite is where a garden scene is created with fingerprints and inscribed onto the piece is ‘Thanks for helping us grow and bloom! We can help you with ideas if you pop in and see us at the studio, but we know that many of you and your children create fantastic things independently. 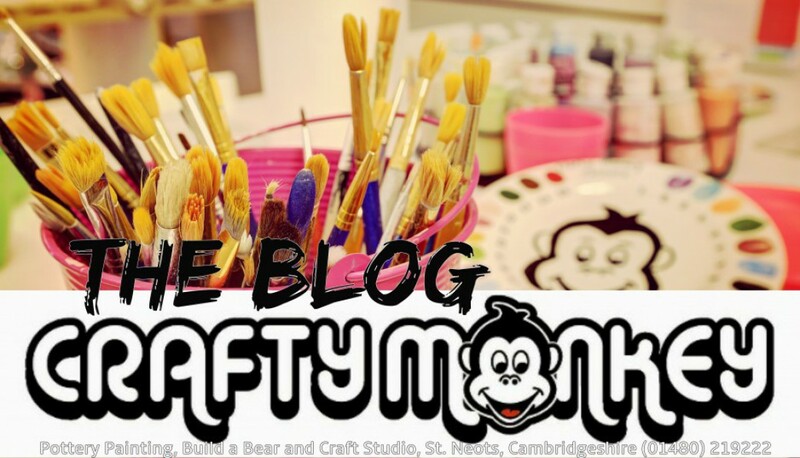 From the elaborate masterpiece, to the downright barmy- we’ve seen it all at Crafty Monkey! However, our personal favourite teacher gift from last year has to be a dog bowl painted by a little boy for his canine loving teacher, on which he had inscribed the words ‘Teacher’s Pet’. Full marks to that pupil for inventiveness! Call us to book in.